NEW YORK -- U.S. stocks ended lower on Wednesday as the Federal Reserve cited weakness in the U.S. economy and data showed U.S. growth slowed more sharply than expected in the first quarter. But the Fed's acknowledgement of weakness in some sectors of the economy makes it more likely it will not be ready to raise until at least September, which kept stocks from falling further. 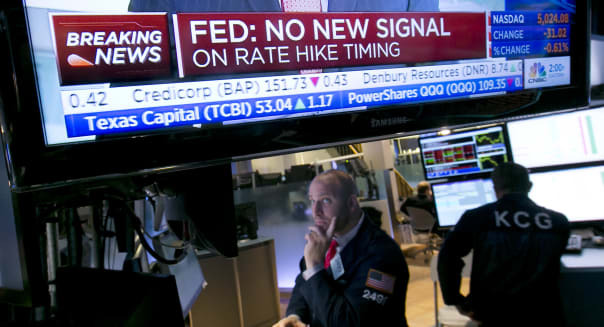 "We all know the Fed would love to start normalizing rates, but the simple fact is, the data does not warrant that action right now," said Wayne Kaufman, chief market analyst at Phoenix Financial Services in New York. While concerned about lingering economic weakness, U.S. investors also are worried about the possibility of the Fed raising interest rates too soon. Seven of the 10 S&P 500 sectors ended lower, with just energy, financials and materials in positive territory. Insurer Humana's (HUM) shares fell 7.2 percent to $168.05, the second-biggest loser on the S&P 500, after results missed forecasts. Shares of rivals also fell, including UnitedHealth (UNH), which was down 3.4 percent at $113.61. The S&P health care index was down 0.8 percent, the biggest drag on the S&P 500 (^GSPC). Twitter (TWTR) fell 8.9 percent to $38.49, a day after the company cut its full-year forecast due to weak demand for its new direct response advertising. Other decliners included Wynn Resorts (WYNN), which fell 16.6 percent to $108.77 after the casino operator reported weaker-than-expected first-quarter profit. Salesforce.com (CRM) jumped 11.6 percent to $74.65 after a Bloomberg report that it is working with financial advisers to help field takeover offers after being approached by a potential acquirer. The Dow Jones industrial average(^DJI) fell 74.61 points, or 0.41 percent, to 18,035.53, the S&P 500 lost 7.91 points, or 0.37 percent, to 2,106.85 and the Nasdaq composite (^IXIC) dropped 31.78 points, or 0.63 percent, to 5,023.64. The central bank's policy statement put in place a meeting-by-meeting approach toward the timing of its first rate hike since June 2006, making such a decision solely dependent on incoming economic data. Earlier in the day, data showed gross domestic product expanded at an only 0.2 percent annual rate as harsh weather put off shoppers and energy companies cut spending. Declining issues outnumbered advancing ones on the NYSE by 2,023 to 1,008, for a 2.01-to-1 ratio on the downside; on the Nasdaq, 1,853 issues fell and 867 advanced for a 2.14-to-1 ratio favoring decliners. The benchmark S&P 500 posted 11 new 52-week highs and 1 new low; the Nasdaq composite recorded 54 new highs and 51 new lows. About 7.2 billion shares changed hands on U.S. exchanges, above the 6.3 billion daily average for the month to date, according to BATS Global Markets. At 8:30 a.m. Eastern time, the Labor Department releases weekly jobless claims, 8:30 a.m., and the first-quarter employment cost index; the Commerce Department releases personal income and spending for March.